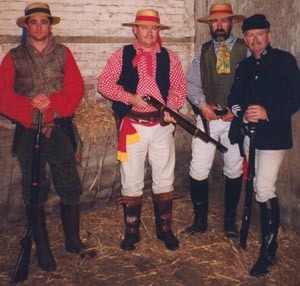 In recent years the activities of bushrangers have been popularised in books and movies. Many country towns from the Hawkesbury River through the Hunter Valley and the New England Ranges to southern Queensland and as far west as Bourke, boast a Thunderbolt landmark. Police and Justice Museum in Sydney. Today Thunderbolt is a regular visitor to Tocal events. For futher details see coming events. Photograph: A group of actors re-enact some of Thunderbolt's exploits at Tocal. They are standing in the stables attached to Thunderbolt's Cottage.